Industrial Marketing Today: The Case for Personalized Approach to Industrial Branding. Think about a consumer brand that caught your attention recently. It may have evoked a positive response, humor, or welcomed nostalgia. It is highly likely that many brand names popped up in your head. Now think of an industrial brand that made a lasting impression on you. Racking your brains, huh? With the exponential explosion of impersonalized and jargon-laden marketing in the industrial space, it is indeed very hard to come up with interesting industrial brands that have become embedded into public consciousness. 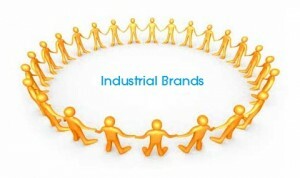 One would argue that industrial brands are here to win a niche market-share and not become a household name. There is a prevalent mindset within the industrial sector that says, “It’s lead generation and sales that matter to us the most. We do not need brands that aspire to inspire people.” As a Boston-based B2B branding and inbound marketing agency, our team of brand consultants works very hard to break this stereotypical mindset. If industrial business owners care about lead generation and sales, they should also care about building a distinctive brand that not only sets them apart from their competitors, but also connects with their target audience on a personal level. Whether B2B or B2C, you’re in business to sell product and services—ultimately—to people. Your brand helps you to build relationships that win the hearts and minds of the people who resonate with the brand message and drive the purchase decision. According to an article published on “Think with Google,” B2B brands fare better with customers through emotive rather than rational marketing messages. When industrial companies need a brand consultant, they come to us for re-branding and other content marketing services; our entire team looks at these B2B companies through our special proprietary Focus 2020™ brand lens. The majority of the time we find that their marketing efforts are largely focused on the “what we do” and don’t answer the “who we are” for their consumers. . In simpler words, they aren’t bridging the relationship gap for customers. Traditionally, industrial marketing has limited itself to communicating the functional attributes and business outcome of the brand (what we do), while it fails to effectively convey the personal value of the brand through emotional appeals (who we are).Professional direction from an inbound marketing agency helps connect the communication dots, creating a greater relationship picture with appeals that include making customers feel truly valued, ,become part of a vision-oriented culture, perform better, and achieve more. No matter how complex your product or service offerings are–whether you are selling pressure-mapping sensors, aluminum anodizing, or microwave ferrite filters—it is important to communicate the value proposition of the brand using a mix of emotional and rational cues. To better illustrate the case for industrial branding with a customer-centric approach, Grant Marketing recently re-brandedFourstar Connections, a Hudson, MA-based contract manufacturing company. As part of the re-branding process, our team of brand consultants interviewed its customers and internal stakeholders, conducted a brand audit, and analyzed its competitors. This interactive process helped determine the true perceived value of the brand that, in this instance, had nothing to do with the contract manufacturing services and solutions it offers. What we uncovered was the strong identity they held as entrepreneurs that partner with leading companies to innovate and solve manufacturing challenges. They help businesses turn their concepts into realities. This discovery process produced the brand positioning statements: “Finding a better way” and “Turn your concept into reality.” These are centered on the personal value Fourstar Connections brings to its customers. Because hundreds of millions or billions of dollars are involved in industrial transactions, you would assume that the decision-making process is rationally driven; and by demonstrating superior business value, you would be able to create a winning differentiation strategy for the brand. Think again—your competitors can also claim impressive business outcomes and deliver similar business value that you are providing to your customers. In reality, business value alone won’t set you apart from your competitors. The role of emotions needs to be factored in the branding process; this is where industrial companies will leverage their competitive advantage. This personalized approach to industrial branding adds layers of personality intrinsically tied to the company or organization, which provides a deep and detailed level of differentiation. Industrial marketing has changed drastically; it no longer speaks the language of hard-sell. Lo and behold! It’s more a dialogue of personal relevance and engagement, intended to forge a deeper connection with the target audience. Through our proprietary Focus 2020™ branding process, Grant Marketing helps industrial companies define their brands in messaging that speaks directly to their customers and prospects.